We’d love your help. Let us know what’s wrong with this preview of Doctor Who by Mark Morris. Barely escaping with their lives, they discover that the city is rife with tales of 'half-made men', who roam the streets at night and steal people away. These creatures, it is said, are as wh India in 1947 is a country in the grip of chaos - a country torn apart by internal strife. When the Doctor and Donna arrive in Calcutta, they are instantly swept up in violent events. 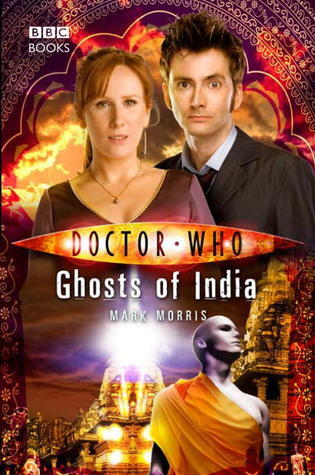 The Doctor and Donna travel back in time to India, 1947 - the latest in the bestselling series of Doctor Who novels. 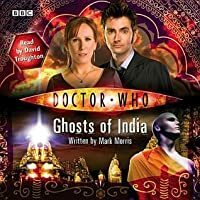 Arriving in Calcutta in 1947 during the last few days of British India, The Doctor and Donna are soon thrust into a chaotic situation as country is currently being torn apart by internal strife. Giving a snapshot of an important part of India’s history, this adventure really brings the time period to life. The descriptions are so vivid. I really liked the young character Adelaide who asks The Doctor questions, it’s a great way to teach younger readers about the era and Gandhi significance to histo Arriving in Calcutta in 1947 during the last few days of British India, The Doctor and Donna are soon thrust into a chaotic situation as country is currently being torn apart by internal strife. I really liked the young character Adelaide who asks The Doctor questions, it’s a great way to teach younger readers about the era and Gandhi significance to history. Well, let's start with the good stuff: This book is a definite page turner. Author Mark Morris writes a good, energetic portrayal of the Tenth Doctor, and keeps the plot moving along at a good clip. The monsters are creepy, and the plot isn't quite as simple as it first seems, leading to some nice twists. Still, I found this book ultimately disappointing. I was tempted to rate it a bit lower than I did, but to be fair, it's not any worse than most of the other BBC 10th Doctor novels, most of whi Well, let's start with the good stuff: This book is a definite page turner. Author Mark Morris writes a good, energetic portrayal of the Tenth Doctor, and keeps the plot moving along at a good clip. The monsters are creepy, and the plot isn't quite as simple as it first seems, leading to some nice twists. Still, I found this book ultimately disappointing. I was tempted to rate it a bit lower than I did, but to be fair, it's not any worse than most of the other BBC 10th Doctor novels, most of which I've given 3 stars to. It's just not any better, and I had higher expectations. First, I don't think that the book makes all that effective use of its Indian setting. There are elephants, temples, and some inter-caste tension between characters, but these all feel like window dressing on a plot that could have taken place equally well on an alien planet or in London. Except for the involvement of Gandhi. Which brings me to the second thing that makes me a bit uncomfortable about this book - the use of Gandhi as, essentially, the Doctor's temporary sidekick for the story. The character is portrayed respectfully, and, as far as I can tell from my limited knowledge of Gandhi's biography, accurately. And it is kind of cool to see a character who can be so totally unfazed by aliens. Or anything else. But the way various characters in the book keep saying how much alike the Doctor and Gandhi are gets on my nerves. Sure, they share some traits - curiosity, open-mindedness, a sense of humor, and a peculiar charisma. But honestly, it's the way in which these two characters are different that's interesting. This book could have made some really interesting contrasts: Gandhi's fatalism versus the Doctor's refusal to accept things as they are; Gandhi's absolute commitment to non-violence versus the Doctor's willingness to resort to force when necessary; Gandhi's ability to inspire collective action versus the Doctor's individualism. This is one of the better Doctor Who audiobooks I’ve listened to recently. I ended up listening to it straight through. The writer captured the Doctor and Donna well and made it interesting, exciting and humorous in places too. It’s The Tenth Doctor at his most enthusiastic and energetic. It’s Donna Noble at her most cheerfully shouty. It’s a story of the last days of Colonial India, but one with added aliens, zombies and mutated scorpions. And – as the most insane, over the top detail of it all – a book where The Doctor’s companion for a large part of its length is the actual Mahatma Gandhi. Most of the time, because after all it is a product of Western culture, ‘Doctor Who’ engages with other parts of Western culture. It’s The Tenth Doctor at his most enthusiastic and energetic. It’s Donna Noble at her most cheerfully shouty. It’s a story of the last days of Colonial India, but one with added aliens, zombies and mutated scorpions. And – as the most insane, over the top detail of it all – a book where The Doctor’s companion for a large part of its length is the actual Mahatma Gandhi. Most of the time, because after all it is a product of Western culture, ‘Doctor Who’ engages with other parts of Western culture. Here though it has a go at Eastern culture, and it does okay at it – respectful in a kind of Sunday night drama type way. Without a doubt there’s a certain ‘Jewel in the Crown’ (or, a more modern reference, ‘Indian Summer’) quality to the portrayal of the Indians themselves, and their relationship with the – alternatively over-bearing, snobbish or compassionately kind – British. But that’s not a problem as this is ancillary fiction to a TV show, and so if it feels like an adaptation of a different kind of TV show that’s fine, as if Doctor Who actually did an India set story on TV, this is almost certainly how it would be. Loved the setting here, and Morris really captured the characters of Donna and the Doctor - as well as making me care about all of his original characters, which is rare and difficult to do. This could easily have been an episode of the show. Unfortunately, reading this did sadden me a little, as it reminded me of a time when Doctor Who was just so much better than it is now. In Ten's era the writers weren't afraid to explore more complex themes, and to illustrate the nasty side of human nature. Loved the setting here, and Morris really captured the characters of Donna and the Doctor - as well as making me care about all of his original characters, which is rare and difficult to do. This could easily have been an episode of the show. As a huge Dr. Who fan, I initially thought that this book would be a bit too simple for my tastes. I was wrong!!! This was just as exciting as watching an episode of the new series of "Dr. Who" on t.v.! Morris really captured the personality of the 10th Doctor in this book. The Doctor and his companion, Donna, are hungry for curry. When they land the Tardis they find themselves in Calcutta - but in 1947. They hear stories about creatures that are half-human that steal people at night. Some of th As a huge Dr. Who fan, I initially thought that this book would be a bit too simple for my tastes. I was wrong!!! This was just as exciting as watching an episode of the new series of "Dr. Who" on t.v.! Morris really captured the personality of the 10th Doctor in this book. The Doctor and his companion, Donna, are hungry for curry. When they land the Tardis they find themselves in Calcutta - but in 1947. They hear stories about creatures that are half-human that steal people at night. Some of the people feel that this is Shiva the destroyer. They feel that he has come back for vengeance! Of course, the Doctor has to investigate this! They meet up with Monhandas Gandhi, who aides the investigation. It was written a bit teenie, but was very enjoyable none the less. India, a great setting and the appearance of Mohandas Gandhi as a character in the book was a bonus. Lots of funny little lines for the Doctor and Donna. Much to David Tennant's acting credit that the Doctor comes alive on the pages of the book, with me being able to hear his voice delivering lines, visualising his mannerisms and facial expressions. I loved Donna here, her voice was perfect. But the Doctor's holier than thou attitude irked me like whoa. And the fact that the author presented Gandhi as a perfect specimen without any flaws, a creature of pure goodness, considering what's known of, for example, how he treated his wife, made me downright angry. Well done, and Donna was written perfectly - strong-willed but still learning. The treatment of Gandhi and her appreciation of him, and his fascination with the Doctor and things alien were great fun as well. And of course he figures into the solution. The novels are nice because they can go places unrestricted by a television show budget. Space aliens & Mahatma Ghandi! 'Nuff said. loved it, gandi was in it and was quite funny. Mark Morris is a great writer. Characters are captured perfectly and its a very fluidly written story. I'm not proclaiming myself any kind of Gandhi or meditation expert, but isn’t curiosity in a sense self-indulgence, and by the version of Gandhi in this book he does not allow himself any self-indulgence, and as such he shouldn’t be “too good”? That kind of confuses me, also because it seems like an almost Gandhi-religious text at some level. Furthermore, I listened to the audiobook, and all respect to King Peladon – is his version of the Indian characters not a tat on the racist side? Just the I'm not proclaiming myself any kind of Gandhi or meditation expert, but isn’t curiosity in a sense self-indulgence, and by the version of Gandhi in this book he does not allow himself any self-indulgence, and as such he shouldn’t be “too good”? That kind of confuses me, also because it seems like an almost Gandhi-religious text at some level. Furthermore, I listened to the audiobook, and all respect to King Peladon – is his version of the Indian characters not a tat on the racist side? Just the fact that they all sound like cartoon versions of Indians speaking English kind of put me off the whole thing. The setting- India 1947 was interesting and well-developed for a Who novel. However, I was irked at the author's portrayal of Gandhi, while he did a lot of good for India, he was also a racist. One of the plot points in this novel was that Gandhi's soul was pure and had no hatred in it- when it clearly did, no one is perfect. Apart from that, a good portrayal of Donna and The Doctor and at only around 200 pages, it's fine. This review has been hidden because it contains spoilers. To view it, click here. Definitely would have made a good episode and I read it in David Tennant's, Catherine Tate's and, (don't know why) some-Indian-actor-who-starred-in-Heroes' voices. The plot was very 10th Doctor and Donna styled. I enjoyed it all the way, although, for a non-Whovian the idea of a villain shaped like a plant with thousands of eyes and a high-pitched voice could seem ridiculous. I love how Ghandi was a major character in this story! And Donna is so cheeky- one of my favorite companions ever. Oy! Mark Morris' version of Donna has just the right level of snark and concern, playing off the Doctor and delivering snappy one-liners. It's so good to see her again. Good old-fashioned Doctor Who fun. I loved it. It was a nice doctor who story. The characters were very compelling and very accurate to the show. I loved Gandhi. It was a really fun read.